BOISE, Idaho — Matthew Wright was a young man with many interests and passions, including anchoring the news and weather for the Capital High School TV station. KCHS-TV is part of the video production class at Capital, a class where Matthew also shot and edited a lip-synced music video to the Rick Astley hit song "Never Gonna Give You Up." "This class is definitely going to be part of of my life and a huge part of who I am," Matthew said in his last interview for the video production class. His was a life filled with interests and passions, but it was a life cut short. "Well, this is Matthew's urn. His welding class at Dennis Technical made it for us," Mathew's mom, Ann Wright, says pointing out some of the things on the memorial to her son that sits just inside the front door of the family's home. "I mean it's just a reminder every day of, you know, he was here and it's important," Ann said. It includes symbols of things he loved - The welded urn because he loved welding, and wanted to start his own welding business; a Moose because he shared a love of the grand animal with his grandfather; and a picture of him with his beloved dog, Sprite. "After [Matthew] passed I went through his phone and he probably had 300 selfies with the dog," Ann said. Matthew died on March 26 of 2018, a couple days after a car crash on Highway 21 in Boise. The Capital High School and Dennis Technical Education Center senior was just 18 years old. Boise Police say a pickup truck coming the other way turned left in front of him and they collided. A year later, his mom says it's been tough on her, her husband and Matt's brother and two sisters. "You know we just kind of have banded together as a family," Ann said. "My husband and I are definitely closer. We just try to help each other out. "I still have days when I have meltdowns and there's no rhyme or reason to it I could be just fine and then something will remind me of him, a song will come on, or..." she said, trailing off. One thing that gives Ann some peace, some solace, is knowing her son saved four lives by donating his heart, liver and two kidneys, and gave sight to two other people by donating his corneas. "Even though Matthew is gone as Matthew, he's helping other people, which is what he did," she said. Matthew registered as an organ donor when he got his driver's license. He talked to his parents about his wishes not long before his accident, expressing how strongly he felt about being an organ donor. "And had we not had that conversation, I would have never known," Ann said. She stresses how important it is to talk with your family about your wishes when it comes to organ donation, so everyone knows where everyone stands. "It doesn't surprise me that he was an organ donor at all," she said. "He wanted to be helpful to everyone." His friends in the video production class wanted to be helpful in honoring him. They put together a touching tribute video in which they talked about the funny, caring, good friend and person he was. His classmates will always remember Matthew fondly. "Matt was definitely one of the biggest goofballs I've ever met," Roman Bolen said. "He was so nice to everyone," Naomi Lukehart said. "Matt was basically the best person I've ever known," Alex Donahue said. "I knew him since first grade. He would basically do anything for anybody." Ann Wright will always have him in her heart and head, but also on her arm. She has two tattoos dedicated to her son. One of them is the Donate Life green ribbon with the date Matthew donated his organs. The other is a moose. On the lower edge of the moose, Ann explains, there's a bass clef because Matthew played the stand-up bass. Underlining the moose is a digital readout of his heartbeat as it would have been seen on a hospital monitor. At the end of the heartbeat are Matthew's initials in his handwriting. "I just carry him with me all the time, and then you pull up your sleeves and you think about him and you smile," Ann said with a smile. 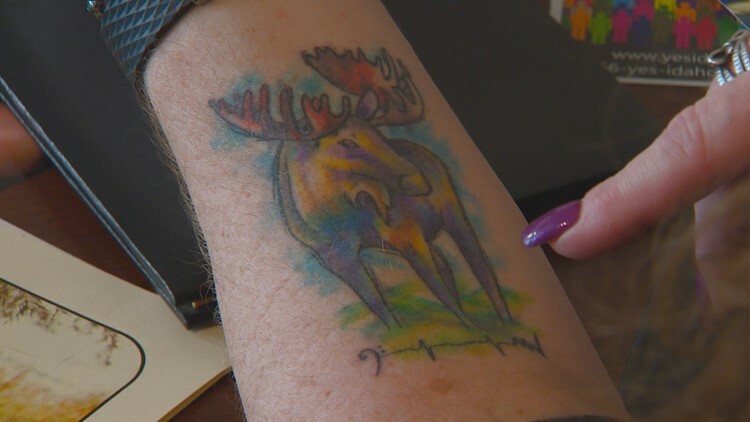 Ann Wright got a tattoo of a moose in honor of her son, Matthew. April is National Donate Life Month. KTVB is once again partnering with "Yes Idaho" to raise awareness about organ, eye and tissue donation. "Yes Idaho" says about 114-thousand people are on the waiting list for an organ transplant. Each week this month we're sharing a story of someone who has either received or given the gift of life. If you'd like more information on organ, eye and tissue donation, check out the Yes Idaho website, where you can also find out more about the first-ever "Dash for Donation" fun run to raise awareness about organ donation. Ann Wright is helping to organize the "Dash for Donation." She put together a team in Matthew's honor called "Matthew's Mafia." It has more than 100 members so far.